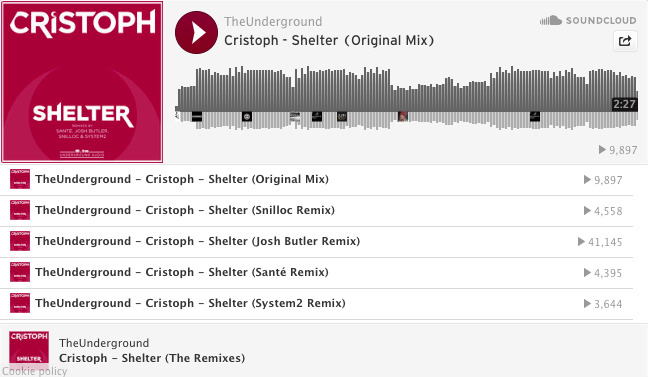 Radio 1 - Pete Tong "Red Red Hot, everyone is talking about it" Underground Audio are proud to present brand new remixes of Cristoph's highly acclaimed 'Shelter' track. 'Shelter' is set to be one of Cristoph's most successful acclaimed releases, vinyl copies are currently in production and will be circulating toward the end 2014. Support on the single reads like a who's who in House Music, featuring in leading charts from the likes of Jay Lumen, Dale Howard, Mihalis Safras, Sante, Him_Self_Her & Sidney Charles. Huxley "Shelter is dope"
will be playing all of these"
Him_Self_Her "Shelter for us thanks...will def play out and support!" Rebel "Feeling this a lot. Good stuff!" DeMarzo "Always excited to hear what Cristoph is bringing. Cheers!!" In his early years, Cristoph was influenced by the sounds of his fathers Motown vinyl, paired with his older brothers Chicago and Detroit house cassettes, not a bad combination even if we do say so ourselves. This nurtured a passionate love for music from an early age, with him citing Masters at Work and 'MK' as early influences. From North to South and everywhere in between, Cristoph has been causing a storm on the dance music scene. His effervescent, broad ranging style encompasses heavy basslines, uplifting melodies and carefully chosen vocals, spanning the deep house to techno spectrum. Having had two No 1's on Traxsource main chart with "On The Inside" with Noir music, it has been a busy year for Cristoph with bookings in Ibiza and across Europe. Remixes on this hot package courtesy of Sante, Josh Butler and Snilloc with early support from the likes of Hot Since 82 and Richie Hawtin. Snilloc takes things a slightly funkier vibe with a grooving baseline, clever staccato synth stabs and a big brass horn making this a dance floor must have. Next up is Josh Butler with a hypnotic heads down groove. Berlin star Sante emerges with quality a deep, dark mix. Showcasing his excellent production skills and a clever percussive groove. Last but certainly not least ViVa Music's new boys System2 come up with an underground floor shaker to round off this wicked package. > SEFF - Hot Creations All great remixes but I've been playing the Sante Remix for a while now and it's massive!! > Denney - Hot Creations Great package here, Josh butler and system2 all the way for me. Thanks! > James Silk - Exploited Great Pack! > Newbie Nerdz - Madtech Records Strong Pack! Original still a bomb. Sante & Josh Butler remix for us ! > David Glass - Circus Recordings Every mix is nice!! system 2 at it again, their remix is my fav out of these! > Inner Rebels - Nervous/Sleazy Deep Sante remix for us!!Biggg!! > Kreature - Nervous Records Sante remix for me! > Max Chapman - Dilate Records Absolute belter of a package. Loving everything from UA. > Mennie - Nervous/Noir Music I played so many times the original and I think this remix pack too...in particular Snilloc Rmx and System2 Rmx! Super pack!!Thanks. M! > Luca C - Hot Creations/Crosstown Rebels Nice pumper! > Timo Garcia - Exploited/OFF Love the old skool X-Press 2 vibe of System2 remix and the old skool Todd Terry vibe of Butlers one but mostly I like the nu skool vibe of Sante's version! > Nils Nuernberg - 8 Bit/Drumpoet Community Nice original mix. THX a lot. > Ekkohaus - 2020 vision Original is my fav, thanks. > Man Without A Clue - Defected Records Big fan of Cristoph. Really good EP, thanks for sending, will defo support! > Rafa All remixes are great! > Florian Kruse - Composite Records/Noir Music The original is still outstanding. Hard to beat this track with a remix version. Sante and Josh Butler are my favorites mixes here. > Mykel Haze - Hot Waves Thanks for the send pal - all playable stuff and some major remixers in there dude. > Karotte - Cocoon Club Netherlands Sante rmx for me. > Wojtek Kutschke - Champloo Music Original & Snilloc remix for me. Thanx! > Pacha Ibiza Resident - Graham Sahara Have played the original solidly for months. Liking Josh Butlers interpretation and also the Sante version will give them a run out. > Kenny Substance NYC LOVIN these, especially Snilloc and Sante remix! Big! > Circus Liverpool - Ki Creighton LOVE these mixes, full support!!! All 4 are ACE!!! > Carl Kennedy Superb track & an amazing Josh Butler remix, which will def be the one ill be hammering out! > The Mekansim - Noir Nice EP!!! > Joseph Capriati - Awakenings Festival Downloaded and thanks. > Bogdan Taran - Berlin Love Parade Original is still the strongest to me, but among remixes Josh Butler version making me stomping feet, System 2 remix bringing the track to a deeper level. > Ison/Actor one - Reworks Festival Wonderful remixes, among the favorite tracks of the year for me here, Sante and Josh Butler are my faves. > Runge - Nervous Records/Get Physical Bass heavy release! Josh Butler remix is my fav of the bunch! > ROUX Soundsystem Great stuff! Love the fact that the remixes are quite different. > Jepe - Blossom Kollektiv/Get Physical Great Release. Will try this for sure! > Alvaro Marquez - Istinto Records Great EP, full support. Josh Butler and Sante remixes for me, thanks! > Peter Gelderblom - Spinnin Records Josh Butler Remix for me, thanks. > Parrish James - Beta Nightclub Thanks for this! > Joyce Muniz - Austria Dope remix package, I still in love with the original!! > Hector Couto - Hot Creations/Get Physical Josh Butler remix 4 me, nice one!! > Him_self_Her - Crosstown Rebels Sante remix is ace! Massive! > A Lister - Newstate Josh Butler Remix is heavy! > Made to Move Josh Butler remix is awesome! Thanks! > Andy Raeside - Censored Wicked package with some cracking remixes, will support the original on "On The House radio" tonight, will also test out the Josh Butler mix. BIG package. > Alex Blanco - Mayasehenk Nice. Really digging the original and Josh Butler's done another fine job. > Tough Love - OFF Recordings JB remix is cool, but still prefer the original. > Joel Xavier - Seamless Recordings Total vibes here Original and System 2 Remix gonna get rinsed. > Zombie Sound System Snilloc remix for me thanks. > Sergio Matina - Kontor System2 Rmx for me. > Jody Wisternoff - Way Out West Loving this, supporting thanks!! > Dan Stritch - RTE Pulse Sante remix for me, supporting on RTE Pulse. > Andi Durrant - Kiss UK/Amnesia Ibiza/Ministry Of Sound Downloading on behalf of Andi Durrant. > Pointblank FM Got the original first time round, loving josh butlers mix gonna slam this on my sets and Pointblank FM, wicked remixes top stuff. > The BPM Station - USA Really feeling these remixes, from deep warehouse beats to smooth upfront baselines, all of the production is tight and dance floor ready. The original track just as strong as the remix's. Well done! > AMDJS Radio Show This is absolutely gorgeous package! Will spin A LOT. Thanks. > Shlomi Biton Tunnel Fm/2B Continued Radio Nice package, Sante's remix stands out for me! Cheers. > IVibes This is just down right DIRTY! Can't get enough of it! > Radio FG Very nice EP, support! > Representz Radio Christoph smashing up the scene right now! Track after track! > Tim Andresen Original is huge! > Technotramp.com One of the hottest tracks of the summer, Cristoph's banger "Shelter"
> Ibiza-Voice English producer Cristoph has struck gold with the vibe of his latest four track EP by nailing the bottom-heavy club house vibe that straddles being underground and in the slightly punter-friendly zone that has sat well with big guns like Roger Sanchez types forever. > Thetechnokittens The EP is packed with a selection of dark house anthems; opening track 'Shelter' kicks things off with a driving bass line and some energizing builds. The gritty piano chords of 'Purvy' are what makes this track stand out as our top pick from the EP - it continues the dark house vibe with equal amounts of passion and groove. 'Tell Me' is an atmospheric track that will immerse you and carry you into the night of whatever dance floor it possesses. And closing things off with its funky bass line is 'Move On', a track that builds with a sporadic synth melody and catchy percussion. A top notch EP that marks Cristoph as an up and coming talent to certainly keep an eye out for. > Wearesoundspace 'Shelter' is set to be one of Cristoph's most successful acclaimed releases, vinyl copies are currently in production and will be circulating toward the end 2014. Support on the single reads like a who's who in House Music, featuring in leading charts from the likes of Jay Lumen, Dale Howard, Mihalis Safras, Sante, Him_Self_Her & Sidney Charles. > Lipstick Disco Josh Butler remix for me. > Underground Tel Aviv Sante remix for me, thanks! > Knights of the round table Featured and loved on the site. To Promote your release to the worlds Tastemaker DJ's, visit our website for more info.